Until all dogs evolve to this skill level, it is up to pet owners to clean up their messes. Unfortunately, some of the folks walking with dogs are not cleaning up after their pets. The evidence is right at the curb, near the mailboxes, and sometimes right in the middle of the street. It is an unpleasant topic but it must be addressed. If you own a dog, these unwelcome feces (are there any other kind?) pose a direct danger to your pet. They can carry disease or parasites (hookworm, roundworm, and campylobacter) which can spread throughout the dog community quickly. The poop also is a severe health hazard for small children, organ transplant recipients, immune system compromised patients, and the elderly. If you own a dog, clean up after your pet. There are bag carriers that attach to leashes and collars like the one for sale here (and here). 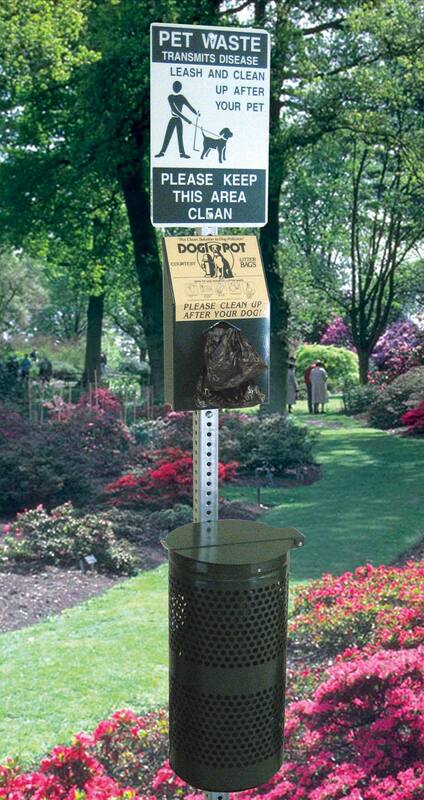 Note: Many dog owners do clean up but then place their bags in the closest available private trash bin. Many of the trash removal companies simply leave these baggies behind when hauling the big bags of trash (why are they so picky? We don’t know!) This leaves the homeowner to clean up the bags. Solution: Take your used doggie bags back to your own trash to minimize your impact and be a good neighbor. Doggie bag dispenser and receptacle. Should we invest in one of these or ask pet owners to be individually responsible? You can also email Janet Donahue, Lewisboro Town Clerk (914-763-3511). Town law prohibits dogs from “Creating a nuisance by defecating, urinating or digging on public property or private property other than that of its owner” among other things. New changes in state and local dog laws took effect in 2011. The town and lake community can help as well. The community can help educate residents about the dangers of dog poop. The town may be able to help by getting “doggie bag” dispensers and possibly receptacles placed strategically around the lake. This is a possibility, even more so if grant money can be obtained and used. Together we can help stop this problem and keep our wonderful lake neighborhood clean and healthy for all residents! Please write any comments or ideas you have in the comments section below. Love the idea of the doggie bag dispenser and receptacle. Great article and we totally agree. I just returned from South Beach, Fla where there are dog bag dispensers and receptacles and everyone cleans up after their dogs. Right now Gilbert St could be renamed “dog poop” street. If receptacles were provided people might be encouraged, and not be so “disrespectful” of our beautiful lake loop.